Shirts With Random Triangles: Crane operator alledegly fired for flying Alabama flag on construction site at Texas A&M's Kyle Field. 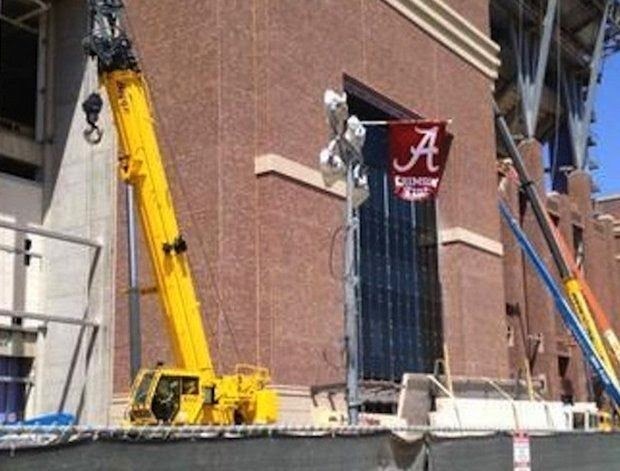 Crane operator alledegly fired for flying Alabama flag on construction site at Texas A&M's Kyle Field. Alabama flag flying at Kyle Field. Via al.com. The budding rivalry between Texas A&M and Alabama has reportedly cost A crane operator working on the renovations at Texas A&M's Kyle Field his job. The unnamed operator was fired after allegedly flying an Alabama flag at the construction site. And when I say "alleged", I mean there's photo evidence of the 'Bama flag flying atop what appears to be some kind of lighting equipment. Texas A&M officials refused to confirm to SEC media gadfly Clay Travis whether any construction workers' employment was terminated due to the incident. "We are unaware of how the Alabama flag was placed on the Kyle Field jobsite," the school said. "But it was removed once discovered." The contractor on the project, Manhattan-Vaughn, is claiming that the now (allegedly) ex-crane opertator "had been working for a Subcontractor on the project," and stated that the company was "not involved in the Subcontractor’s employment policies and therefore cannot comment as to why he is no longer working on the site." Travis states that the fired worker was not a graduate of the University of Alabama. Take that as you will.